The scent of chaos hangs heavy in the air. 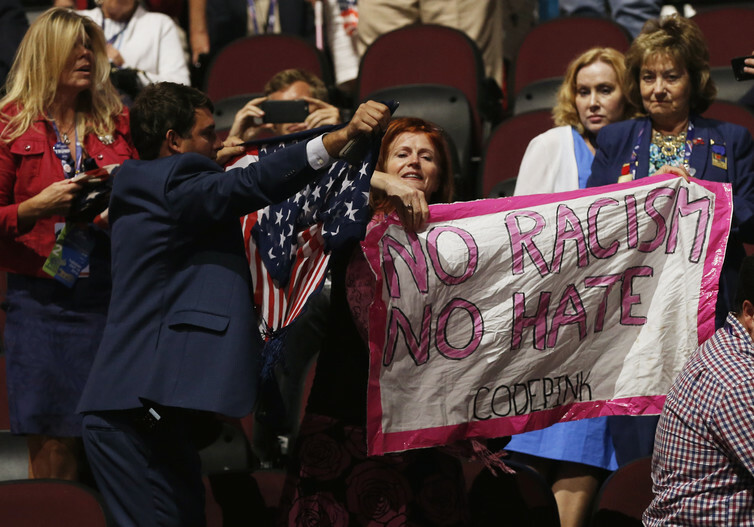 Donald Trump evokes it in Cleveland. Islamic State sows it in Nice, Brussels, Paris, Orlando. Britain is immersed in it after Brexit, while the EU struggles to prevent its onset amid mounting crises of migration and political legitimacy. Ukraine and Syria are being torn apart by it, and Turkey looks fragile after a failed coup. To apply a metaphor from the science of chaos, we are, it seems, in a moment of phase transition. A state of relative global order – the Long Peace, as Steven Pinker describes it in The Better Angels Of Our Nature – has existed since 1945. We’re now moving into a new configuration of competing powers and ideologies, the structure of which we cannot predict, except to assume it will be very different from what we have known. The intervening period of transition, which we may have entered, could be chaotic, destructive and violent to a degree that no one born after 1945 in the industrialised countries that constructed the post-war order can imagine. The great battles of the era now underway or emerging are not those which dominated the late 20th century – left versus right, east versus west, communist versus capitalist. Since the fall of the Berlin Wall, these binaries have had less and less relevance. It is the dark forces of nationalism and religious sectarianism that now drive global politics, fuelling the rise of a crude, xenophobic populism in the advanced capitalist world that we have not seen since the 1930s. Trump is the most vivid manifestation of it, but we see it everywhere we look in formerly stable social democracies – Germany, Denmark, the UK, France, Greece, even Australia, where the demagogue Pauline Hanson’s One Nation party was returned to the Senate in the recent election. Appeals to nationalism and fear of the “other” are replacing notions of collective security, common interest and the moral duty to care for those in need such as asylum seekers. Trump openly praises Putin and Saddam Hussein for their leadership and effectiveness (which in Saddam’s case, lest we forget, included the use of chemical weapons on his own people). NATO, he declares, is past its sell-by date, as are all international climate change and trade agreements which he judges to be against America’s interests. 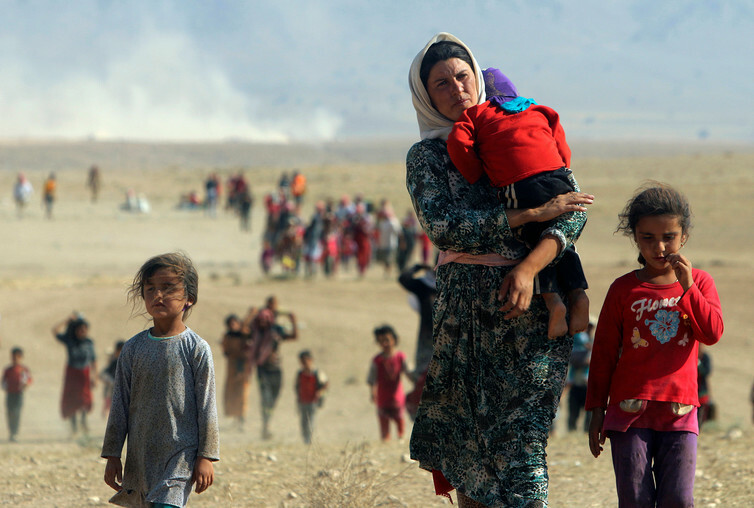 People continue to flee violence from forces loyal to Islamic State. In 2006, two years before the global financial crisis, and five years after al-Qaeda’s September 11 attacks on New York and the Pentagon, I wrote about the cultural chaos then emerging as an unforeseen, unintended consequence of the internet. “Its roots,” I wrote then, “lie first in the destabilising impact of digital communication technologies … Not only is there more information out there, the speed of its flow has increased. The networked nature of the online media means that an item posted in one part of the world immediately becomes accessible to anyone with a PC and an internet connection, anywhere else – linked, signposted, rapidly becoming part of the common conversation for millions”. As a consequence, I argued, established elite power was leaking away, becoming more porous. As 9/11 showed, we had entered a world where affluent, stable democracies were vulnerable as never before to disproportionate disruption by terrorism. A world where policy – as in the case of the EU and the current migrant crisis – was driven not by rational calculation so much as the power of testimonies, narratives and images captured and shared on digital media. No one doubts the humanitarian impulse underpinning Angela Merkel’s decision to offer open house to millions of refuges from the Middle East. This policy was fuelled by distressing, globally networked accounts of desperate people drowning in Mediterranean waters, and pictures of children dead on the tourist beaches of southern Europe. But if it contributes to the rising influence of anti-immigrant party AfD and the rise to power of its equivalents in France, Italy, the Netherlands, it will come to be seen as having hastened the fragmentation of the European Union; to have been an ill-considered response to a crisis amplified and intensified by 24-hour, always on, real time news and social media culture. 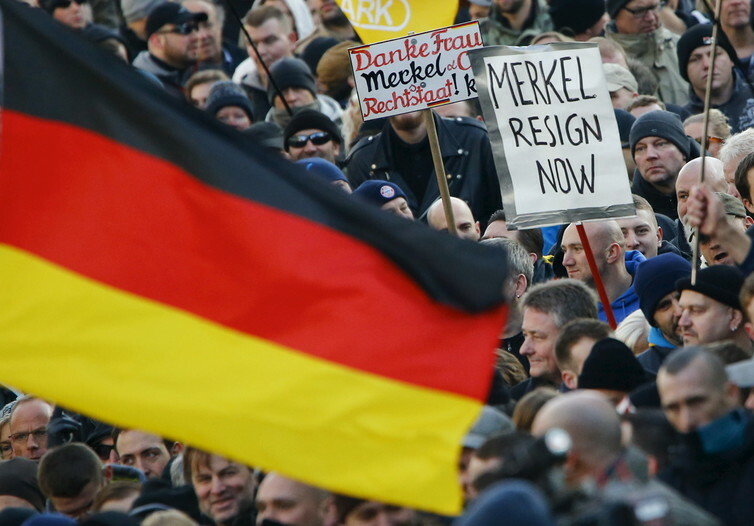 Supporters of anti-immigration right-wing movement PEGIDA demand the resignation of German Chancellor Angela Merkel. Notwithstanding the huge benefits brought to people and societies all over the world by the internet, then, it also presents challenges to the capacity for the good governance and rational decision making on which our collective well-being depends. In a world where information of all kinds – nasty as well as nice, false as easily as true – travels faster, further, and with fewer possibilities for censorship than ever before in human history, authority and the exercise of power are uniquely precarious. Greater transparency and accountability of governing elites – what Sydney University professor John Keane calls monitory democracy – remains a positive benefit of digital technology. The internet made WikiLeaks, and the revelations of Edward Snowden and the Panama Papers possible. It gave every digitally networked individual on the planet all nine volumes of Sir John Chilcot’s report with its devastatingly forensic details of how and why Tony Blair took Britain to war with Iraq in 2003. You may choose not to read it, but it will be your choice, and no-one else’s. If power is built on knowledge, and effective democracy requires that citizens be informed about their environment, the age of digitalisation has also been one of global democratisation. It has made popular challenge to authoritarian rule easier to organise (if not necessarily to succeed). Cultural chaos, like chaos in nature, can be a constructive as well as destructive force. This media environment sees isolated events which would once have been of mainly local importance, such as the Lindt Café siege in Sydney (a “lone wolf” terrorist attack in which two people were killed), become global in their impacts through the immediacy and visceral nature of their media coverage. But it is also an efficient way to disseminate anxiety, panic and fear. Donald Trump understands this, and uses Twitter like no other presidential candidate before him. He is able to further stir up his already enraged constituency with simplistic, authoritarian solutions to complex social problems like illegal migration and global terrorism. IS, like al-Qaeda before it, understands it. Jihadi John cuts off the head of an American or Japanese journalist, and the uploaded, socially networked video becomes a weapon of mass psychic torture, spreading virally. Some Britons voted for Brexit because they had seen those videos, or heard about them. They believe they can be quarantined from radical Islamism by rejecting Merkel’s humanitarianism and closing the doors on the continent. 9/11 cost al-Qaeda $500,000. It cost the world trillions in military expeditions, heightened airport security and other responses, not to mention the hundreds of thousands of deaths inflicted in the “war against terror” since 2001. IS atrocity videos are well produced, but cheap to make, and the communicative power of digital networks does the rest. They are at the heart of a new kind of asymmetrical warfare. The chaos Edward Lorenz described in nature applies also to our globalised, digitised societies. From small bifurcations in the social fabric emerge catastrophic, potentially system-destroying consequences. One crisis feeds into another. Trump’s success fuels French National Front leader Marine Le Pen. The UK Independence Party’s Nigel Farage encourages Putin in his dream of winning back Ukraine and the Baltic states. And as the mass murderer of Nice follows the attack at Ataturk airport, both outdone by the atrocity of Bataclan, we enter a period of cascading, interconnected crises, where “black swan” moments become part of everyday life, and the unthinkable becomes mainstream. The majority of us don’t want to build walls. Have we reached the tipping point between order and chaos at the global level? Is it too late to stop this slide backwards into the vortex of violent nationalism, sectarian hatred and authoritarianism that caused World War II? After a century of unparalleled progress in democratisation and the extension of human rights to women, ethnic and sexual minorities, are we now at the top of the ladder, the peak of a cycle, with nowhere to go but down? No one knows, because by definition the onset of chaos is non-linear and unpredictable. Its precise causes are impossible to identify, and its consequences unknowable. Personally, I think not. I believe not, because I am an optimist and I have confidence in the essential goodness of most people. We – that is, those of us who don’t wish to build walls, or erect borders where there were none, or to prevent others from harbouring beliefs, religions or values different to our own – are still the majority, as far as I can see. Our law governed liberal states still define the rules and set the tone for global culture and politics. Barack Obama won two elections with convincing majorities. If we can engage in this global struggle with the same confidence and commitment as the other side engage in their jihads and nationalist hate-mongering and fascistic public gatherings, not with military hardware but with ideas and words, it is not too late. The journalists of Charlie Hebdo did that, and paid the price. Human rights activist Ayaan Hirsi Ali called for reformation of islam, and has been condemned not only by the mullahs who regard her an apostate but by some western non-muslims for doing so. We must support voices like Ali’s, and add to them, at the same time as we challenge the racists and xenophobes who are feeding off fundamentalist islam’s excesses. That the global system is under unprecedented stress is by now undeniable. The role of the digital media in increasing that stress is also clear, as is its potential to be utilised for progressive reform and democratic accountability. We have to be wise in responding to the first, and smart about fulfilling the second. As to their impact on political outcomes, that remains stubbornly unpredictable. The Arab Spring failed to become a summer. With that knowledge, all we can do is what we must do. Resist the censors, the haters, the authoritarians, religious and secular, the builders of walls, and declare them the enemy of us all, this human race, which will not be dragged against its will into a new dark age. Brian McNair is the author of Cultural Chaos (Routledge, 2006). His new book is Communication and Political Crisis (Peter Lang, 2016). The only way to stop “viral terror” is to expose the CIA role in supporting Islamic terrorists and to impose appropriate sanctions against the US. Thus far no world leaders have the courage to expose this ugly truth. However I sense the time is coming. I do hope that mankind is not going to fall into a new dark age. Alas, Stuart, cannot the US threaten anybody with their military might? How for instance would Australians like to be threatened by the US? People want security, don’t they, and the US know this and our leaders know this.